Interpretation of the light on and around the body using modern technology seems to be showing interesting and useful data. BFR utilises a specially-designed colour filter, which re-colours the pixels of an image (video footage or still images), to enable our eyes to discern more gradations of light than is normally possible with the naked eye. 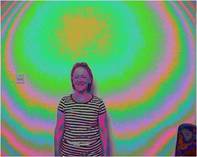 After taking numerous scans and learning to recognise patterns, an experienced user can often gain relevant information about a person’s general ‘energy’ or ‘qi’/'chi'. Analysis of patterns, as well as colours, appears to offer useful information about the state of health or imbalance of the individual. After conducting numerous scans we have found the following correlations. Red and mauve, seen in pools or wide streams, are often seen over 'problem' areas or along channels relating to the problem area. These colours could indicate where qi is not flowing smoothly or where there is stagnation. Colours seen in more healthy/balanced areas are green, yellow and orange. As areas heal, the red diminishes and more green or blue are seen. This is a very basic analysis as the person's biofield is looked at as a whole. Pattern recognition is also a very important part of the analysis of scans. 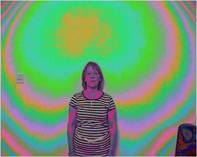 Once I had given him a brief explanation of what the colours indicate he could see for himself where the light/energy had improved after acupuncture. He was impressed with the way his body had responded - especially the green (colour of balance) he could see on his left temple. 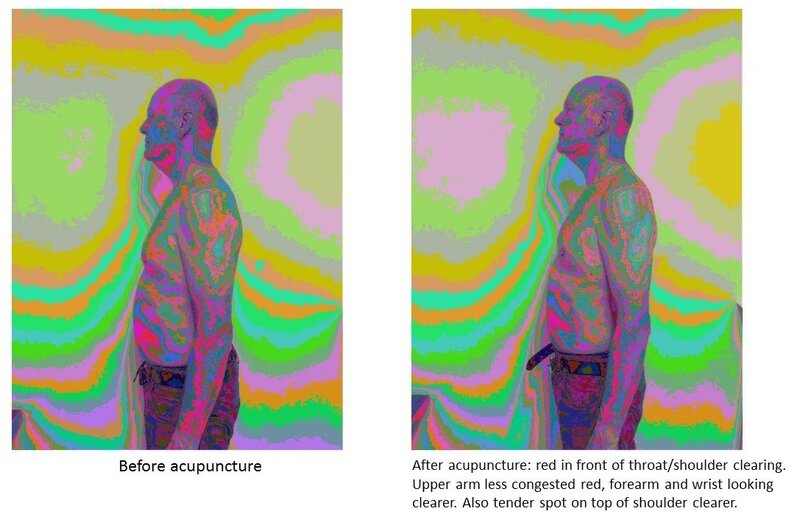 After treatment with acupuncture he reported that his shoulders felt less tense and that his shoulder pain had reduced. I was interested in the fact that GB20, GB21 and SJ5 all showed up as red congested spots before needling and showed less red/more green (on GB21) after treatment. A heavily pregnant woman came to see me in my clinic complaining of numbness, tingling and swelling in both hands. The left hand was worse than the right. Her doctor had diagnosed Carpal Tunnel Syndrome. 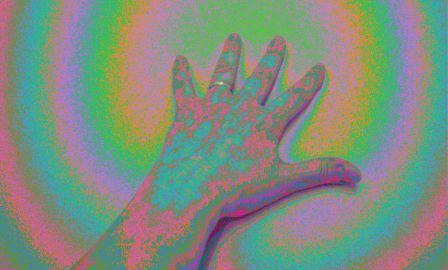 I took some photos of her lower arms and hands with my mobile phone. I had good lighting on ceiling so didn't need to use flash. I downloaded photos to my computer and ran them through BioField Reader. They were interesting. The left arm/hand show more congestion than the right arm. Congestion is seen as red and more chronic congestion (i.e. congestion which has been there longer) often shows as mauve. These colours can be seen 'on' or 'around' the area. This man complained of an irritated red, left eye; skin eruptions over the nose and temples - worse with stress. Diagnosis: Liver qi stagnation generating Heat, Liver invading Stomach and Spleen, Liver yang rising. Note red (which could indicate stagnant qi) to forehead, left eye and throat. Points were needled distally on Liver, Stomach and Spleen channels to treat his imbalances. Local points to left eye were BL2, GB1, GB14, ST2 and Yingtang. GB20 was also needled bilaterally. After the first treatment two small yellow spots appeared on the left upper eyelid. These resolved spontaneously but the subject said that he felt as though something was ‘working its way out’ and that his eye felt much less irritated. Note less red generally and more green (seen in more balanced and areas which are balancing and healing). His skin eruptions were clearing with no new outbreaks. He reported feeling calmer and more optimistic in general. Treatment had been centred on his left eye but on the third treatment the right eye was treated too. Seeing where the ‘light’ or ‘qi’ is congested can be of use to the therapist. This woman came for acupuncture for painful knees. A TCM diagnosis was made and a BioField scan done. Tender points were found at Spleen 9 and Spleen 10 - these show as red and congested on the scan. Relief was felt after needling these areas as well as Sp 5. St 40 also needled. 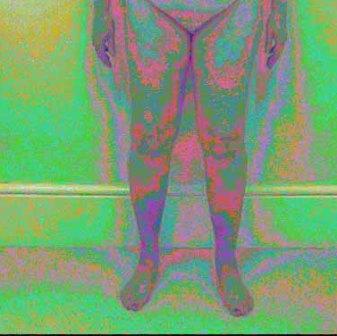 It is interesting that she has had cellulitis on both lower legs exactly where the legs show as blue and mauve. The skin in these areas remains shiny, and sometimes feels hot. 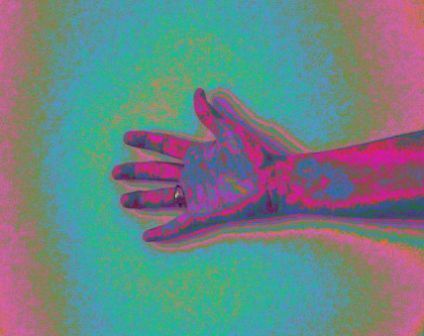 The scan above shows a woman who has chronic arthritis in all her fingers. She suffers with pain in her wrist and fingers. 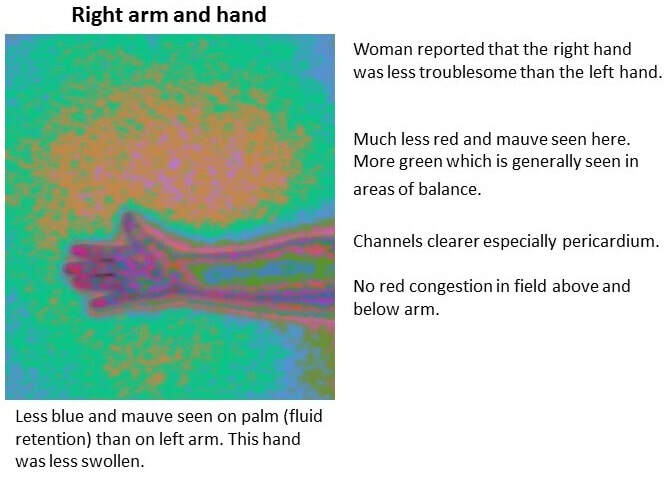 Of note is the red stagnation seen particularly around P7 at the wrist - a common point used for pain in fingers and wrist. Qi is not flowing smoothly down the arm - note wide streams of red. A 'finer' line of red is seen flowing down arms in 'healthy' individuals who report no problems in their hands or arms. The qi is stagnating in her fingers where she has pain - this shows as red on the scan. Before Acupuncture Treatment Woman with left thumb pain and upper back/shoulder tension on left side. Pain felt at acupuncture points LI4 and Lu10. On palpation: tender points were LI15, LI4, LI6, Lu10, SJ5. SJ15 was found to be very tender and 'lumpy'. Before treatment, the woman was asked (to assess her pain level), if she could open and take an acupuncture needle out of its sterile packaging. Unfortunately, she was unable to grip the packaging due to pain. 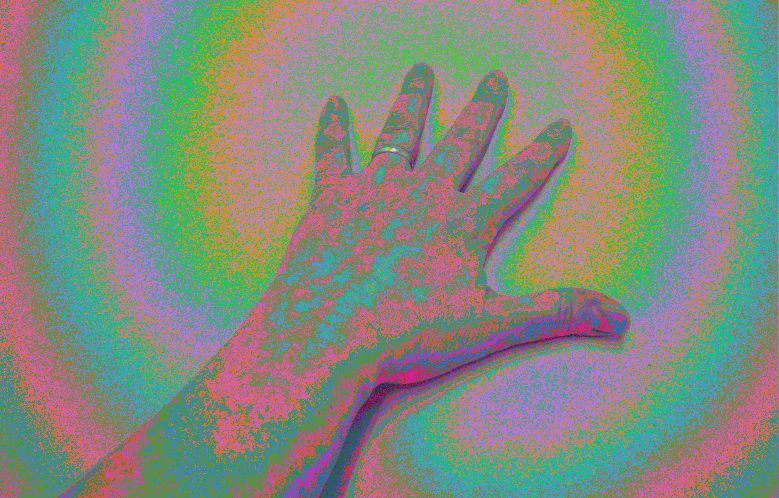 Red stagnant light seen over arm, hand and thumb. See blog for more details. After Acupuncture Treatment Acupuncture needling to LI4, LI6, LI11, Lu5, Lu10, SJ5 - needles retained for 20 minutes. De qi obtained on all points. Acupressure to left SJ15. - elicited a warm spreading feeling down her arm and across top of chest. After needling, she could open and take a needle out of its packaging with no pain. 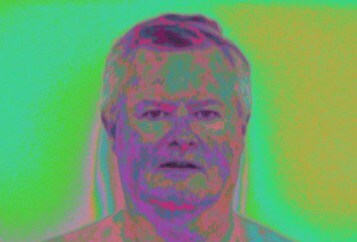 Less red stagnation seen in this scan and more green/blue seen. Green/blue are seen in more balanced areas of body.Photos taken in same lighting, camera position and hand position - with Kodak V1003 digital still camera. BioField Reader filter 001 was used to process photo. 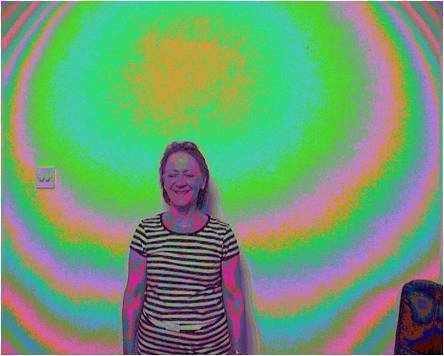 The woman in this scan practises Tai Chi regularly. After the initial scan was taken she did a strong breathing exercise then stood in a neutral ‘rooting’ posture, sending her chi down through her feet into the floor. After 10 minutes of Tai Chi, changes can be seen in her chi. There are reduced pools of red on neck and face; larger areas of blue on throat and face suggesting that these areas are beginning to balance and that chi is flowing. Scans taken by Debbie Hodgson. 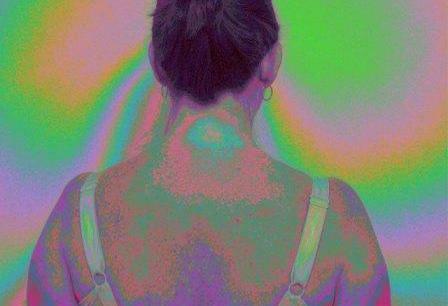 Scan taken of woman with painful neck. She felt pain felt exactly where red spot of stagnation is in middle of blue circle at the back of her neck. There is also some stress in the field around her head and neck generally. Stress bands (asymmetrical) seen to left of her neck suggest that there is an imbalance in her neck energy. The scan above was taken after 7 acupuncture treatments. The energy to the back and around the neck and head has cleared. More green (balance) is seen and less red stagnant energy is seen. She felt much better generally and had much less neck pain when this scan was taken .